There are various files responsible for successful booting of your Windows XP based computer and one of which is Ntoskrnl.exe. Despite the usability of this file, it easily gets tempered and a Windows XP based user becomes unable to boot his/her system. The unbootable system causes inaccessibility of your precious data. To overcome such issues and make your system working, you need to replace or restore Ntoskrnl.exe file. However, if the issue is not solved by this way then reinstallation of Windows XP can solve the problem.There are many reasons to format your computer and start a new, however we must stress the importance of creating secure backups of your files. To recover data, which will be lost after formatting, you can make use of your backup files saved before re-installation. In the absence of updated backup, you would have to try a third-party disk recovery software. This Ntoskrnl.exe file error can sometimes be caused by something as simple as a short in the ground wire in the keyboard cable and can be solved by simply replacing the keyboard. IT can also be caused by a simple corruption that can be easily solved by starting your computer with the “last known good configuration”. When your computer does not start at all, there are simple steps to try first, then we can move to the more difficult solutions. Upon starting your computer on recovery console, a command prompt appears but without any option to log on to Windows installation. 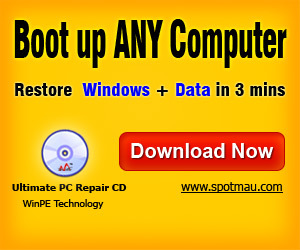 Trying to perform ‘Repair’ operation through Windows XP CD-ROM, the Windows installation is not detected and thus you cannot repair Windows. To rectify this issue, we must understand the cause behind it. What Causes the Ntoskrnl.Exe File to Become Missing or Corrupt? The Ntoskrnl.exe file is damaged or missing. The ‘Default’ value of Boot.ini file’s Boot Loader section is missing or invalid. Windows XP is not installed in the specified location of boot.ini file. The path of the partition in boot.ini file is not set correctly. Start your computer by using CD-ROM of Windows XP. Then press any key to boot from the CD. After the setup files are finished loading, press R to repair using Recovery Console. Now at recovery console, select the installation to log on to (usually number 1), and then press ENTER. Type the password of the Administrator account and then press ENTER to login to this account. Note: In these two commands, the <cd-drive> placeholder represents the drive letter of your CD drive, and the <hd-drive> placeholder represents the drive letter of the hard disk on which windows is installed. If you are prompted to overwrite the file, press Y. Type exit, and press ENTER at the command prompt. Start your computer in Recovery Console and then run CHKDSK/R command. Edit your Boot.ini file to correct or restore ‘Default’ entry and to ensure that other entries in the operating system’s section of Boot.ini file point to appropriate directories. In the run line type: msconfig and press enter. To correct the Boot.ini file, use Bootcfg utility in Recovery Console. The boot.ini file is a hidden system file located in the root directory of your primary hard drive and it is best to access this through your Windows recovery console. Here is a tutorial at the Microsoft website about how to install Recovery console. To edit this file we recommend you follow the below steps. If none of the above recommended resolutions work then reinstallation of Windows XP remains the only way to work around the situation. To recover your precious data which is lost due to re-installation, you can use updated backup however in the absence of proper backup third-party disk recovery software is recommended. Disk recovery software have intuitive user interface (Based on Do-It-Yourself Technology) thus you can recover all your formatted, lost, or deleted data by your own. These software normally runs on Windows 7, Vista, Server 2003, XP, 2000, and NT4 (SP6), & require minimum hard drive space to run smoothly.